The magazines make it look glamorous. The mud is part of the fun. Roaring around the bush on a dirt bike is up there with the adrenaline pumping activities. Hell - I've done it - I know it's fun! That is until someone gets hurt. You can probably imagine my horror, then, when I learnt that some of these 'Weekend Warriors' had bought one of the neighbouring lots to Bogie Bush. I wasn't in horror because they'd moved in. I know a few offroaders and they're really nice people. The horror was from being told that they had bought the bush block for the sole purpose of creating a riding circuit for their children, who don't have full licenses, and therefore can't ride on public roads (including state forests and the like). The block has direct access to the state forest, ideal for the adults with their larger enduros. A few weeks after hearing of this situation, and meeting some concerned neighbours, I had the chance to visit the property. The owners weren't in at the time, but had told the neighbour that there would be no issue for people to cross it. What I saw was beyond belief. Think back to the last time you visited someone in the country. Remember what their driveway looked like? A bit like this? Well now imagine a whole 15 acre bush block covered in tracks like this. No more grass. Trees cut down, laid across tracks and covered in soil to create jumps. Trees sprayed with neon paint to make night riding easier. It's hard to imagine. I had been told this many times before seeing it, and nothing compares to actually being there. I was horrified. Now, you might think "well he's bought it, it's his land, he can do what he likes with it". Not quite. You see, his treatment of his property has led to a heavily reduced humus layer on the ground, meaning the soil will be less fertile and won't retain as much moisture (humus can hold the equivalent of 80-90% of its weight in moisture). 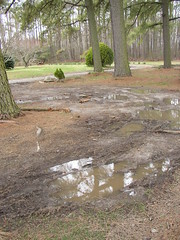 Not only will the soil be less able to withstand drought conditions, but the water will now simply pass straight over. This water runs not only into the state forest, but also into the two neighbouring lots, and causes erosion there. Further, his use of the land for recreational motorbike riding causes the neighbours extreme stress. Imagine being 30 metres from a race track for 4 or 5 hours a day. If you'd paid to go see them at Philip Island, then it would be great. If you were relaxing in your quiet bush block, doing some gardening or bird watching, then it's not so great! What we need is a way to make everyone concerned happy. I'm not suggesting we don't allow people to tear around the countryside on their bikes. Designation of dedicated areas for this activity would make most people happy. Racing down the Hume Highway, although a frequent sight, is not condoned. There are race courses for this purpose. In the same way, lets have parts of the countryside open to motor-bikers. Make sure it doesn't annoy the neighbours and contain it to stop the spread of degradation of the land, and I think most people will be happy. I say most, because there will always be the motor-bikers who want uncharted land (fresh soil) and there will be the environmentalists who want no degradation at all. I don't think either of these groups will ever be happy while the other is in existence. What we need is a middle ground. Both sides need to give, in order to get at least some of what they want.